oh, sweet joy! : the blizzard (not from dq) & the townie. I wanted to do another tutorial today, but I'm not sure if i'll be able to get to it today. It has been snowing so much the past couple of days and it was pretty much a full out blizzard this morning. Okay, maybe not "full out" but it seemed that way to this Texas girl. 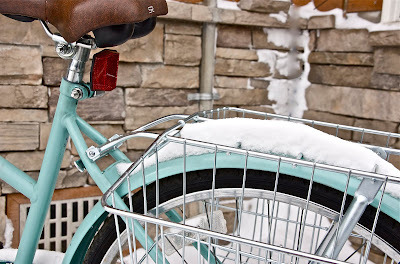 I left my townie out in the snow (oops)... but I think it made for a sweet picture!